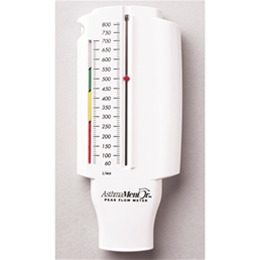 Turn our peak flow meter into your Asthma Action Plan and teach your patients better asthma management in minutes. AsthmaMentor has been designed to help clinicians teach patients what to do when their asthma conditions change. AsthmaMentor’s unique features make the most of the time you have with your patients. The exclusive built-in AutoZone System automatically calculates green, yellow, and red zones when the top of the color bar is set at a patient’s personal best or predicted average PEFR. The Asthma Action Plan Sticker, which provides color-coded areas where you can write medication instructions, can be affixed to the back of the meter. Your instructions are then easily matched with daily peak flow readings, helping your patient comply with them. The sticker provides color-coded areas where you can write your medication instructions, and it can be affixed to the back of the meter. Your instructions are then easily matched with daily peak flow readings, helping your patient comply with them. The diary provides a place to record daily readings, zones, and changes in conditions. 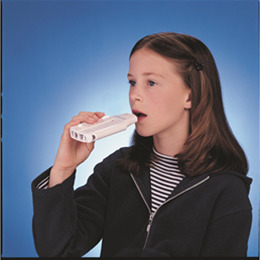 AsthmaMentor meets or exceeds National Asthma Education and Prevention Program Technical Standards for Peak Flow Meters, based on American Thoracic Society Standardization of Spirometry 1994 Update (26 Waveforms).